Our M.C.Ed. degree currently provides a choice of several academic minors to allow concentrated study of different areas of Biblical Education and Apologetics. SOBA’s foundation is Scripture, which the school and its faculty hold as inerrant, accurate, and authoritative. Additionally, biblical creation, with a special emphasis on Genesis 1-11, is a significant focus of all SOBA degrees, majors, and minors. This focus sets ICR’s M.C.Ed. program apart from other graduate-level apologetic programs. 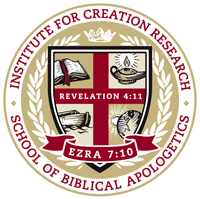 Fulfilling the purpose of training future leaders in biblical education and apologetics, while maintaining a strict adherence to Scripture, is what makes ICR’s School of Biblical Apologetics the choice for those desiring to round out their biblical education with studies that prepare them to “be ready always to give an answer” for the hope within (1 Peter 3:15). The M.C.Ed. program is designed to be a two-year course of study, comparable to 54 semester hours of graduate coursework plus a master's thesis or project, for a total of 60 semester hours. It is possible to complete the M.C.Ed. program in less than 24 months. For a complete description of minors and courses, see our catalog. Biblical Education and Apologetics: Biblical education—the heart of the Great Commission—requires five important teaching elements, as described in Ezra 7:10, which are the preparation of the heart, seeking the Law of the Lord, doing the Law of the Lord, teaching God’s statutes and ordinances, and God revealing His Law to us. This educational emphasis is blended with biblically sound creation apologetics, detailed primarily in Genesis 1-11, ultimately providing accurate and analytical answers to honest questions along with logical refutations of science "falsely so called" (1 Timothy 6:20). Accordingly, an overall 2.75 undergraduate GPA (3.0 in Bible, biblical theology, Christian ministry, and similar coursework) is generally required for admission into the M.C.Ed. program. Students whose overall GPA falls between 2.5 and 3.0 may be admitted on probation (“provisional admission”), which means they will not be officially admitted into the program until they have completed 9 semester hours (i.e., 3 regular courses) with a GPA of 3.0 or higher. Students whose overall GPA is lower than 2.5 may be considered on a “special circumstances” basis, perhaps in conjunction with an examination or other measuring devices, prior to being selected for “provisional admission” status.